2 cousins facing charges over 4 Bucks Co. killings. Dann Cuellar reports during Action News at 11 p.m. on July 14, 2017. SOLEBURY TWP., Pa. (WPVI) -- Two cousins have been charged in the killings of four men in Bucks County, and on Friday afternoon the district attorney's office released its alleged sequence of events in the homicides. One of those men is 20-year-old Cosmo DiNardo. His lawyer previously said his client has confessed his involvement to police. The other man is 20-year-old Sean Kratz of Northeast Philadelphia. He was taken into custody around 2:30 a.m. Friday. DiNardo is charged with a number of offenses including four counts each of criminal homicide, conspiracy to commit criminal homicide and abuse of a corpse. He also faces three counts of robbery. "I'm sorry," a shackled DiNardo said to reporters as he was led away by police on Thursday. Kratz is also facing a list of charges including three counts each of criminal homicide, conspiracy to commit criminal homicide, abuse of a corpse, and robbery. 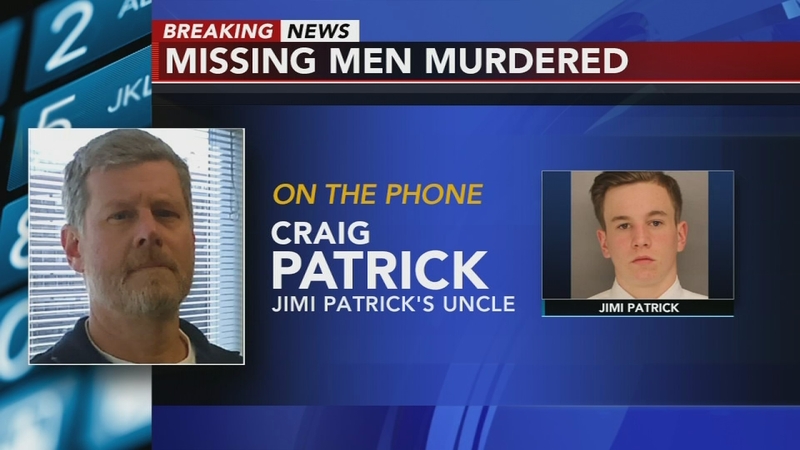 The uncle of one of the four men killed in Bucks County spoke to Action News on the day homicide charges were filed against two cousins. Each victim has been positively identified, Weintraub said, and their family members were briefed on details of the case on Friday morning. The only motive disclosed by investigators was that DiNardo said he wanted to set the victims up when they came to the farm to buy marijuana. According to the probable cause affidavit, DiNardo told investigators that he had agreed to sell Patrick four pounds of marijuana for $8,000. Dinardo said he picked up Patrick at Patrick's home in Newtown on July 5 and drove him to the DiNardo property in the 6000 block of Lower York Road in Solebury, the affidavit says. DiNardo then drove a backhoe that was on the property to where Patrick lay, dug a hole no more than six feet deep and buried him, the affidavit states. Based on DiNardo's statement, investigators located Patrick's body in that grave late Thursday. On July 7, DiNardo told investigators, he agreed to sell a quarter-pound of marijuana to Finocchiaro for about $700, the affidavit states. Watch the full news conference by Bucks Co. D.A. Matt Weintraub announcing murder charges against Cosmo DiNardo and Sean Kratz on July 14, 2017. DiNardo first picked up Kratz, whom he described as his cousin, and drove to Finocchiaro's home in Middletown. DiNardo and Kratz allegedly agreed on the way that they would rob him, the affidavit says. DiNardo said he gave Kratz a .357 handgun belonging to his mother, and then drove all three to the Solebury property. According to the affidavit, he said Kratz shot Finocchiaro in the head as they were leaving a barn on the site. DiNardo told investigators he then took the gun and shot Finocchiaro a second time as the victim lay on the ground. Also on July 7, DiNardo said he met Meo and Sturgis at a church parking lot in Peddlers Village, a short distance west of the DiNardo property on Route 202 in Lahaska, the court records say. DiNardo told investigators that he had a marijuana "deal" set up with Meo, according to the affidavit. Meo and Sturgis followed DiNardo to the Solebury property in Meo's Nissan Maxima, Dinardo allegedly told investigators. Community reacts to Bucks Co. missing men murders. Gray Hall reports during Action News at 10pm on July 13, 2017. After parking the Nissan in the 2000 block of Aquetong Road, Meo and Sturgis rode with DiNardo in his truck to the adjacent Lower York Road property, where Kratz awaited, the affidavit states. After the men exited the truck, DiNardo said, he shot Meo in the back with the .357 handgun, then fired several times at Sturgis as he fled, and Sturgis fell to the ground, the affidavit states. DiNardo said he then ran over Meo with the backhoe before using it to lift both bodies into a metal tank where he already had placed Finocchiaro's corpse, the court records say. Watch video from Chopper 6 HD over the scene in Solebury Township where investigators discovered human remains. He allegedly poured gasoline into the metal tank and lit it on fire in an effort to hide their identities, but the DA said that effort was "not successful." "I don't know what convinced him (to confess). I'd like to think he wanted to get these boys home," Weintraub said at a news conference, explaining the surprise plea agreement forged Thursday that led them to the final body. Authorities might never have found the fourth body unless they worked with DiNardo, Weintraub said. "We'd still be looking for Jimi Patrick had we not made this agreement," Weintraub said. "It was so far away (from the others on the farm) that I started to get sick to my stomach on the ride." DiNardo and Kratz were arraigned on Friday afternoon. The judge denied bail for both men. They will be jailed separately after prosecutors argued the men were dangers to society. NE Philly man in custody, Ambler home search in Bucks Co. killings case. Vernon Odom reports during Action News at Noon on July 14, 2017. The Action Cam was at Kratz's home in the 800 block of Magee Ave. in Northeast Philadelphia's Lawndale neighborhood on Friday after he was taken into custody. Also Friday, police were searching a home and property in the 400 block of Susquehanna Road in Ambler, Montgomery County. The property is believed to be the home of a relative. Authorities had charged DiNardo earlier this year with having a gun despite an involuntary mental health commitment. He was arrested on that charge Monday and held on 10% of $1 million bail. He then posted bail on Tuesday. On Wednesday, he was charged with stealing Meo's car and held on $5 million cash bail. In seeking that bail, prosecutors said he had been diagnosed with schizophrenia. He also suffered a head injury in an ATV accident about a year ago. DiNardo's parents declined to comment after leaving a government building where he spent several hours with Bucks County District Attorney Matthew Weintraub and other investigators on Thursday. Kratz told a judge Friday that he had no lawyer. She replied that he should hire one or apply for a public defender.